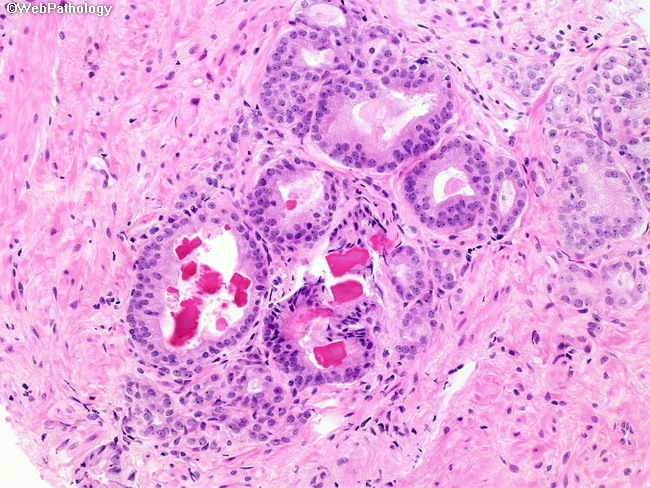 Intraluminal eosinophilic crystalloids are one of the soft (minor) criteria of prostate cancer. They can be needle-shaped, rod-like, polyhedral, triangular, or have irregular brittle shapes. They are associated more frequently with cancer than with benign glands but are not specific for adenocarcinoma. When present, they are usually seen in well-differentiated cancers (Gleason score 2 to 6).